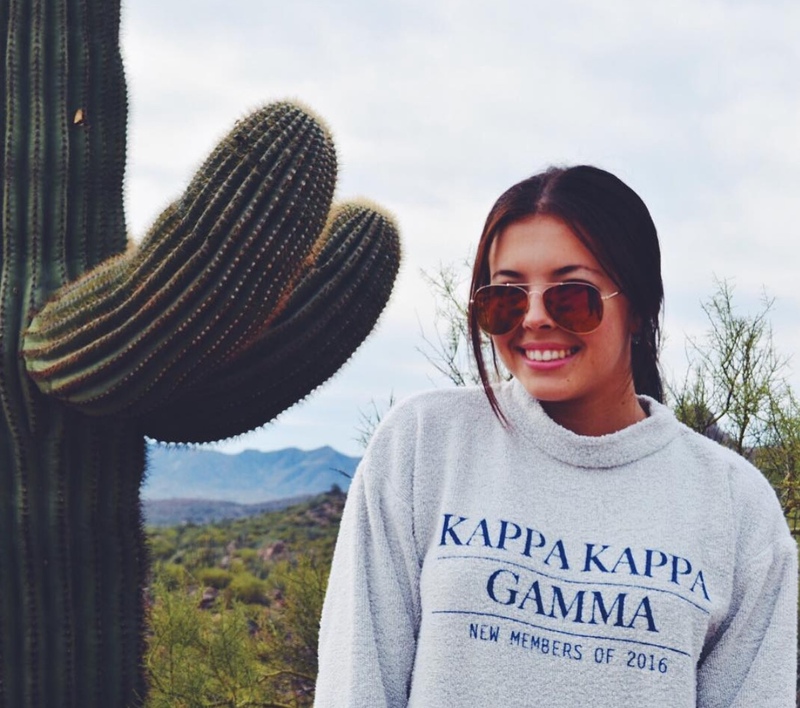 Position Description: As the President of Kappa Kappa Gamma, I serve as the executive officer of the chapter and am responsible for its continuous operation. I represent the Gamma Zeta chapter to the University of Arizona campus and beyond. I encourage teamwork and efficiency to achieve our chapter goals and work closely with the Advisory Board, the House Board, the Fraternity, the campus, and the Tucson community. I foster communication at all Fraternity levels, as well as organize and run all meetings of the Chapter and Chapter Council. I support change where and when needed, lend a helping hand, and make sure our Kappa values are being met at all levels. I strive to lead the chapter with grace, compassion, optimism, and strength to continue Kappa's legacy here on campus and nationally. I am so incredibly excited and humbled by this amazing opportunity to serve as a role model and leader. I couldn't be more honored to represent Kappa’s values to others within the community. 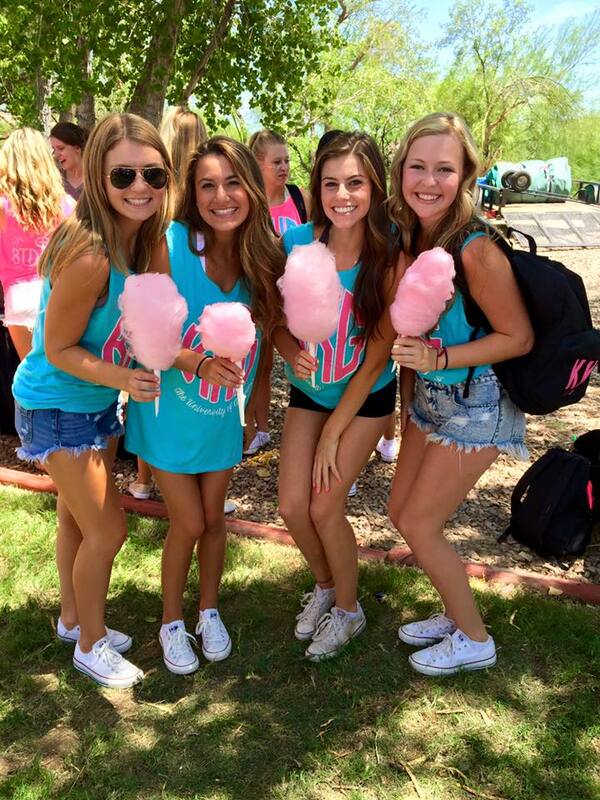 Hobbies:I like spending my time with my family, friends, and my Kappa sisters. 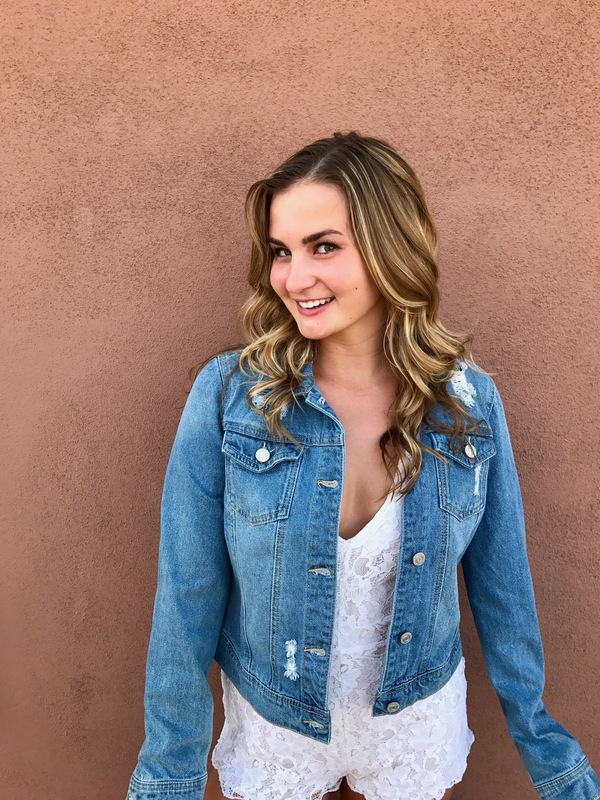 I love snuggling up with my pup Monti, playing volleyball, binge watching Netflix, and trying new places to eat around Tucson! Favorite Kappa Memory: There are so many amazing memories that Kappa has given me over the years that it's hard to pick which one is my favorite. I think one of the most rewarding memories I have would be this past semester when I was interviewing for an internship with El Rio Health Center in Tucson. I had spent an hour talking and laughing with this wonderful lady and towards the end when she asked for my resume, she paused. At the top of my paper it says "Member of Kappa Kappa Gamma" and, once she read that, she looked up at me and started singing one of our ritual songs. She told me that she was a Kappa from Vermont and we spent another whole hour simply talking about all of her memories of Kappa! It was so special getting to meet someone who has felt Kappa's impact during her college years and continues to have a little piece of Kappa in her heart after all these years. 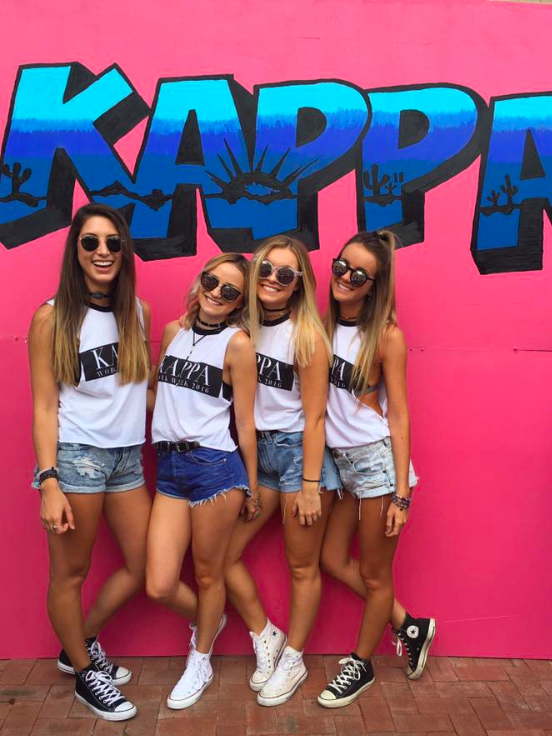 Kappa truly is for life. 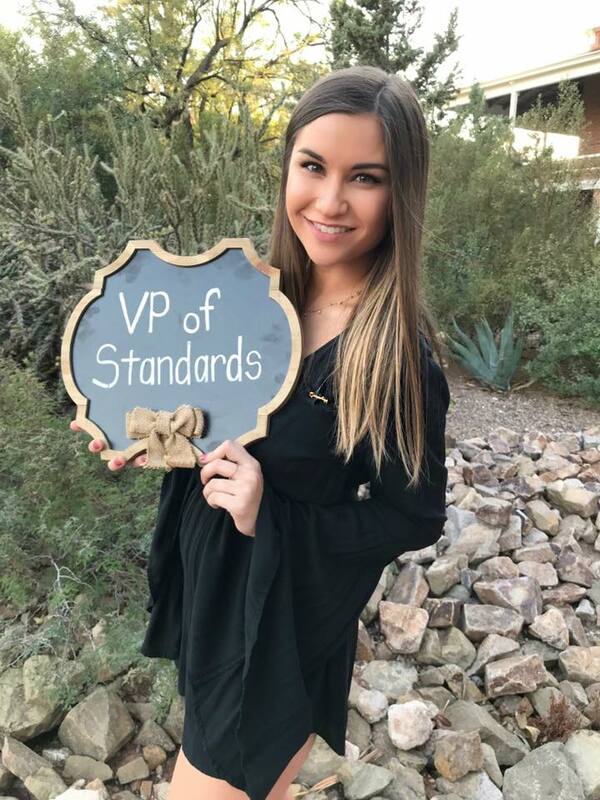 Position Description: As Vice President of Standards, I am the liaison between the Fraternity and the members of the chapter on the understanding and execution of the Bylaws and Standing Rules. I am the head of the Standards Committee and also in charge of planning sisterhood events for all members. I serve as a confidential support system for the chapter as well as maintain spirit and high morale throughout the year. I am spirit chair during recruitment and help with any and all issues regarding Kappa and its members. 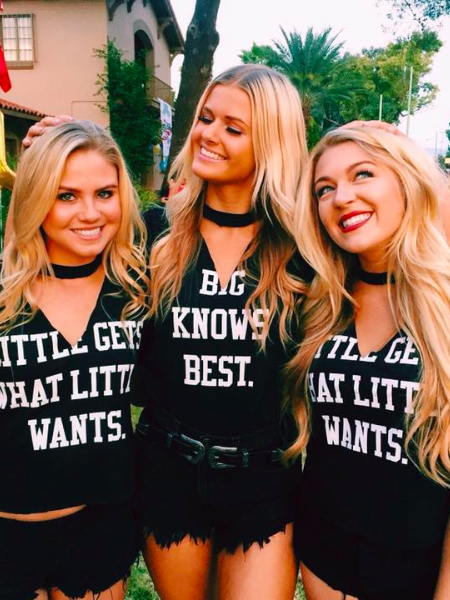 Favorite Kappa Memory: My favorite memory of Kappa is big/little reveal 2017. The moment my two littles ran out the Kappa door and into my arms was the highlight of my semester. Knowing that I would get to be a role model and also have two best friends for the rest of my college years makes my time here at UA and in Kappa that much more amazing! 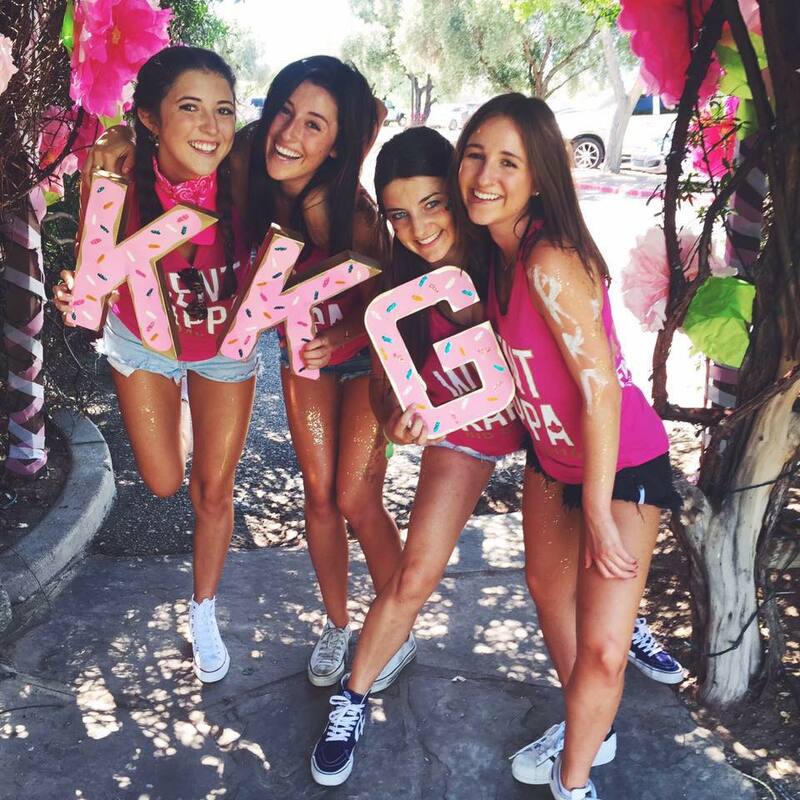 Position Description: As the Recruitment Chair of Gamma Zeta, I am in charge of planning and executing the formal fall recruitment for Kappa Kappa Gamma. I work with our entire chapter to educate them on our methods for a successful recruitment. It is my job to ensure that the active members of our chapter recruit women that possess and are able to uphold the values of our chapter as well as our sisterhood. Hobbies: If I’m not at Kappa, I’m at spin class. Favorite Kappa Memory: I have so many amazing memories from my time in Kappa, but my favorite memory was Bid Day my sophomore year. After a long week of recruiting, it was so exciting and so fun to finally have all the new members in one place where we could all have fun and get the whole chapter, and all of her wonderful new additions, together for the first time! Position Description: As the Membership Chairman of Gamma Zeta, my responsibilities include recruiting the future women of our Fraternity. 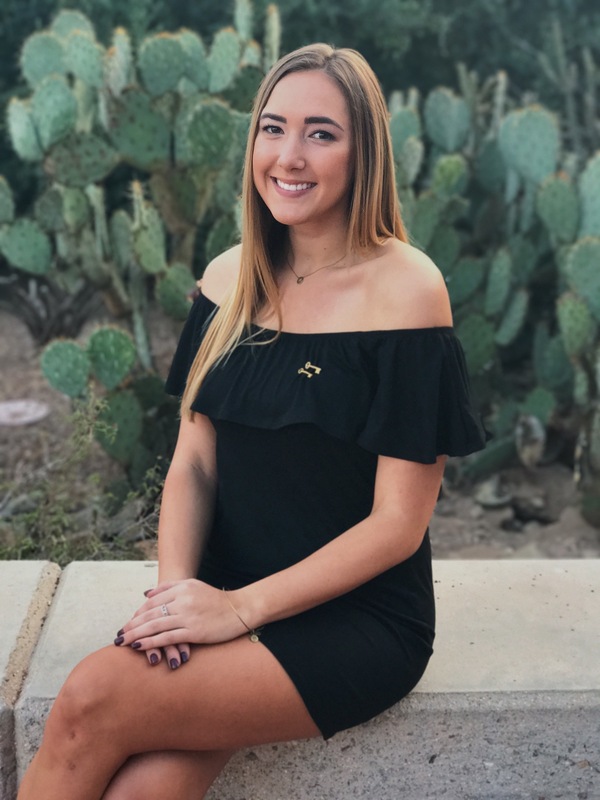 It is my job to ensure active members of Kappa Kappa Gamma recruit women that uphold the values of our sisterhood and reflect the spirit of the University of Arizona. 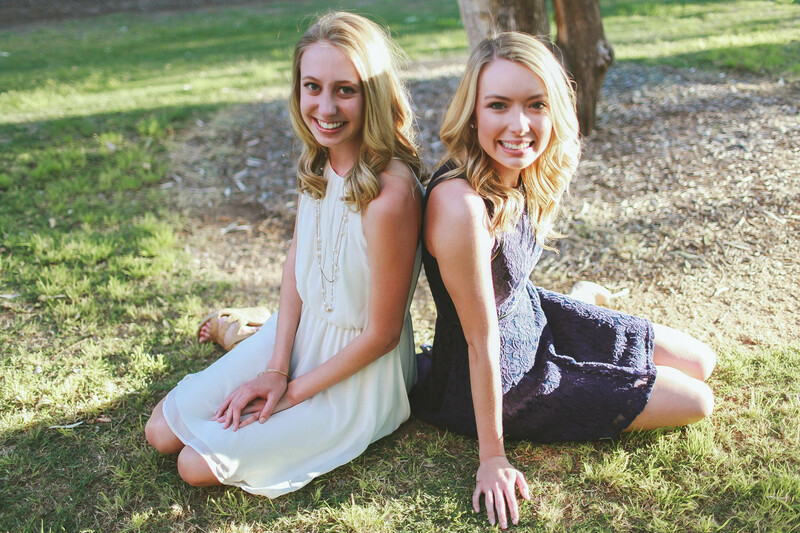 As Membership Chairman I ensure the legacy of our chapter will be embodied in the future women of Kappa Kappa Gamma. 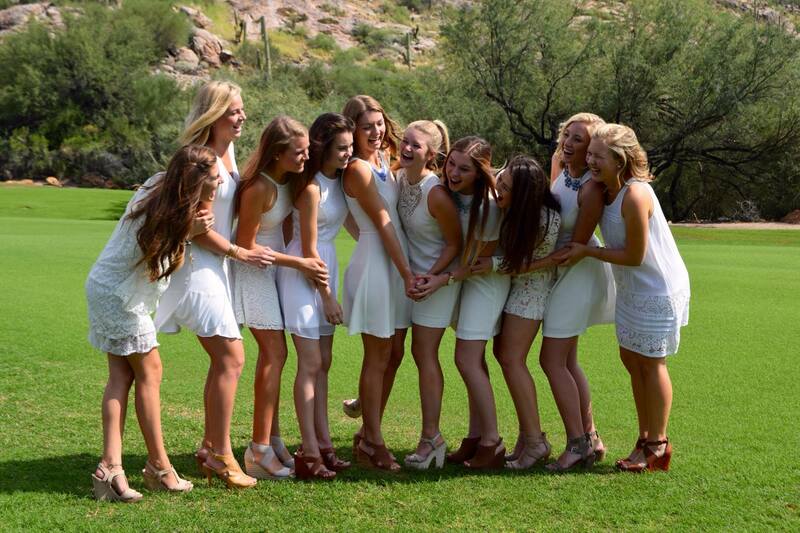 Favorite Kappa Memory: Kappa has given me so many unforgettable memories and friendships. One of the things that I am most thankful for is my best friend, who I wouldn’t have met if it weren’t for Kappa. I have never met someone who can quote every line in every episode of The Office until I met her. She graduated two years early and is applying to med school but we still talk everyday and make an effort to see each other when we have breaks. She comes back for some events and Kappa always welcomes her with open arms. I will always cherish the memories we have made and know we will continue to make more. Positions Description: As VPO, it is my responsibility for upholding the organizational and leadership goals of the chapter through the maintenance of online communication, the creation of a formal calendar, the development of leadership action plans, and hostessing of Leadership Consultants and other Kappa Guests who enrich the chapter with their advice and guidance. Hobbies: Traveling, Netflix, and spending time with friends and family! Favorite Kappa Memory: With too many kappa memories to count, it is hard to pinpoint my favorite Kappa memory. Living in the Kappa House with over 90 of my sisters has provided me some of my favorite memories thus far. Living in the brand new part of the house, I cherish being surrounded by my best friends and so many amazing women on a daily basis. Each day I am inspired by the women around me, and I am so thankful for all the unforgettable experiences Kappa has given me. 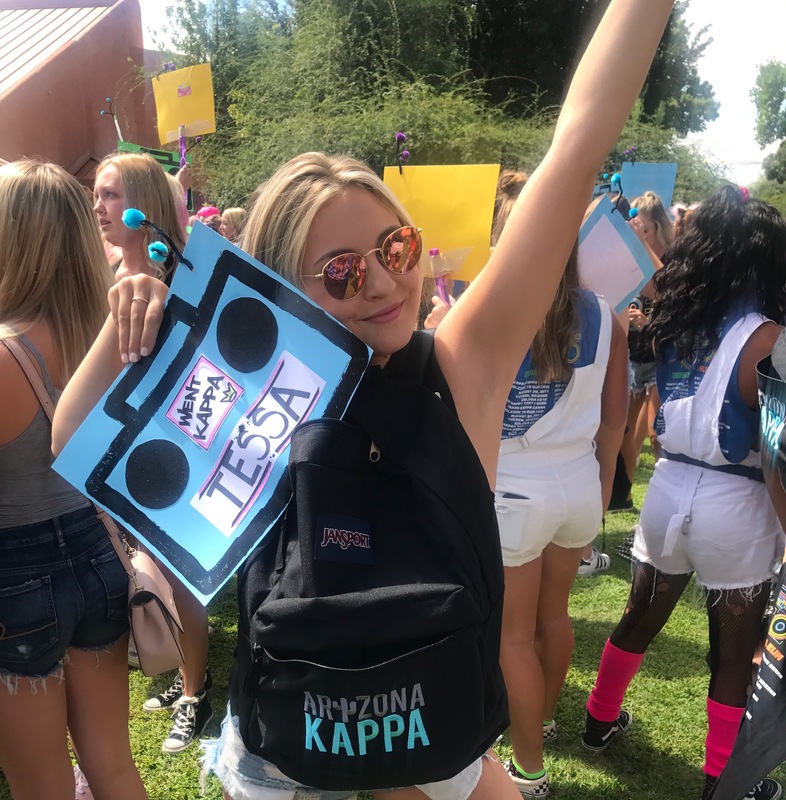 Position Description: As Kappa Kappa Gamma’s Panhellenic Delegate I act as a liaison between Kappa and PanHellenic by keep both parties fully informed. 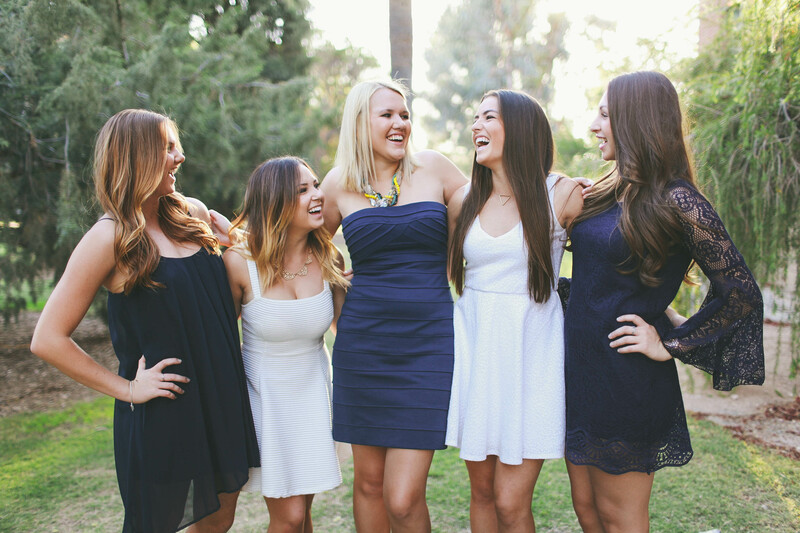 On Panhellenic we work as a team and make executive decisions that pertain to every chapter rather than Kappa alone. As delegate I have to work to make sure that Kappa is represented positively in the Panhellenic community and make sure our voice gets heard. 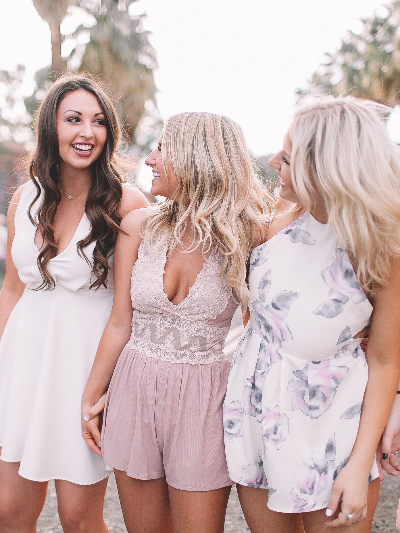 I also maintain and strengthen Kappa’s relations with every chapter on Panhellenic, supporting and upholding every chapter in any way possible. 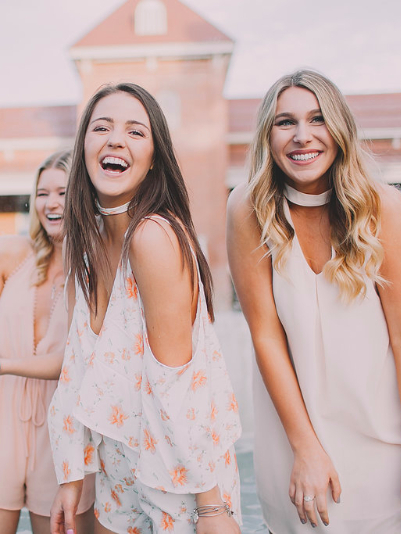 I coordinate sisterhood and other registered events with our sister sororities which is a fun way for the women in the Panhellenic community to get to know one another and make an impact outside of their chapter. In addition I plan and host chapter swaps in which every Panhellenic chapter participates. These events often incorporate service and philanthropy, which also strengthens the bonds within the chapters of Panhellenic and the community. While working with and supporting every chapter I promote PanHellenic love, which helps all Greek women work together as a team on our campus. Favorite Kappa Memory: I’ve had so many great memories in Kappa so far but some of my favorites have come from living in this year. There’s never a dull moment living with 93 girls wether it’s studying or staying up late watching movies together. Kappa and living in Kappa have given me so many amazing memories I’ll cherish forever. 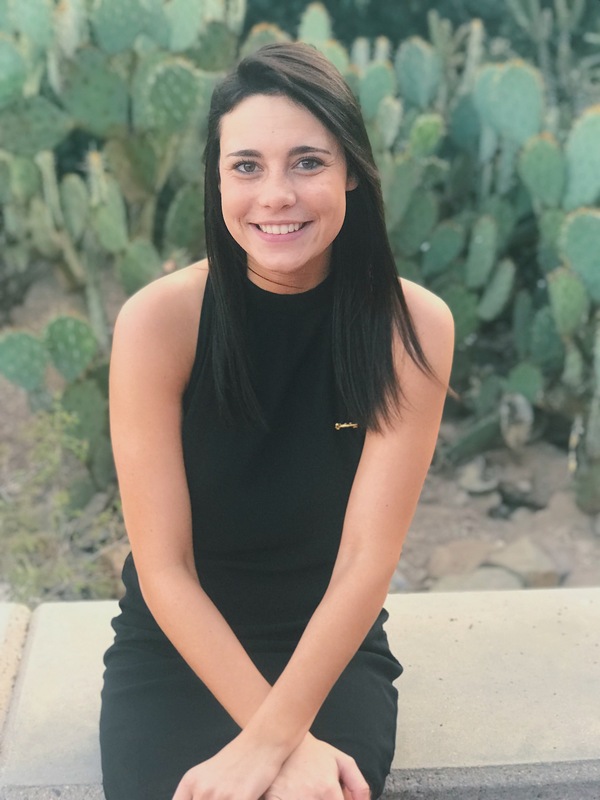 Position Description: As VP of Academics, it is my responsibility to encourage and support the ladies of Gamma Zeta in every aspect of academics, here at the University of Arizona. Each week, I reward members who are working exceptionally hard, inform the chapter of various scholarship opportunities, and provide the tools necessary for members to succeed. 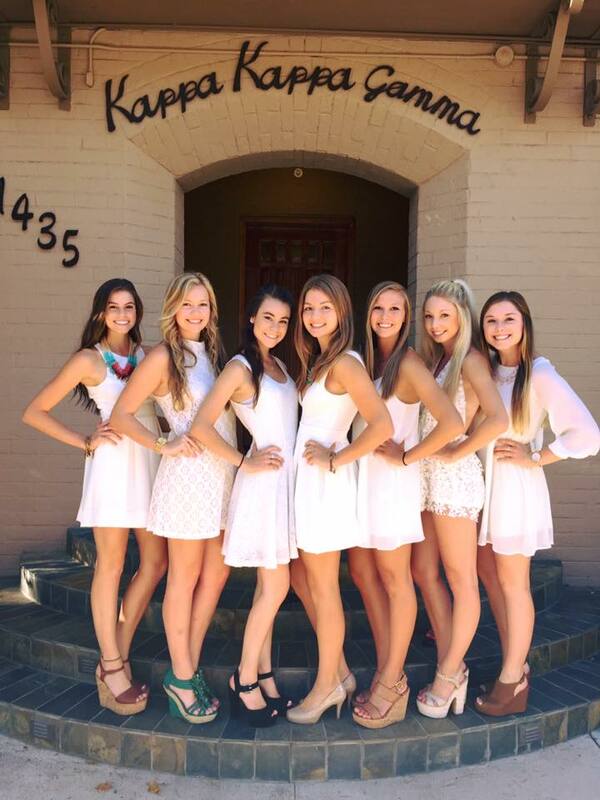 Favorite Kappa Memory: I CAN'T pick just one!! I have made so many memories because of Kappa, especially living in this semester! I love nothing more than watching movies with my roomies, making late night ice cream runs, and living with 94 of my besties! I have truly found my people in Kappa and I am so beyond grateful for all of the memories I have made so far and the ones I know are to come. Position description: As Marshal, I educate the chapter on ritual and tradition. During Inspiration week, I coordinate activities for the New Members to participate in with each other and with the entire chapter. At the end of the week, I organize initiation for all the New Members so they officially become active Gamma Zetas. I also lead the new members in ritual reviews in order to familiarize them with Kappa Kappa Gamma traditions once initiated. Hobbies: Shopping, photography, Netflix, spending time with family and friends. Favorite Kappa Memory: It is extremely difficult to pick just one memory related to Kappa because I feel like I could list hundreds of unbelievable memories. But, my favorite memory overall has been living in the Kappa house. It is truly amazing how lucky I am to be able to live with all of my best friends. We have so many hilarious moments and I couldn't imagine living anywhere else this past year! It truly has been one of the best experiences I could have ever asked for! Position Description: As the Risk Management Chairman, I am responsible for completing an event planning form for all the events we have to participate in, as well as making sure all Kappa events abide by our insurance policy. In addition, I serve as the Health Advocate for our chapter which entails the act of attending several meetings held throughout the school year, participating in an all-day retreat and informing the chapter of various topics throughout the year. Favorite Kappa Memory: Of the many that exist, my favorite Kappa memory has been living in the house with such an amazing group of women. There is nothing I look forward to more in my day then coming home to them as their is always something to do whether its watching a movie in the down stairs TV room or having a dance party in the hallway. 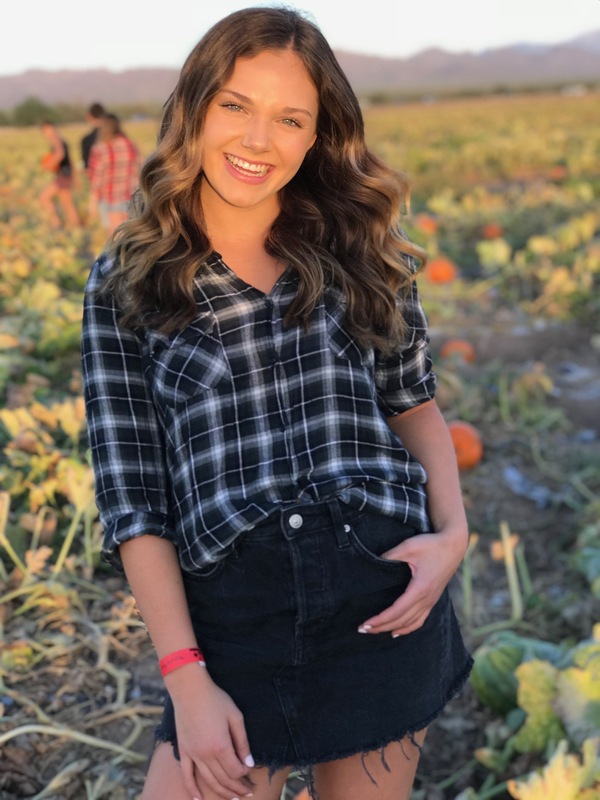 Position Description: As Philanthropy Chairman, I am responsible for Kappa Kappa Gamma’s community service among its members and organizing out philanthropy events. 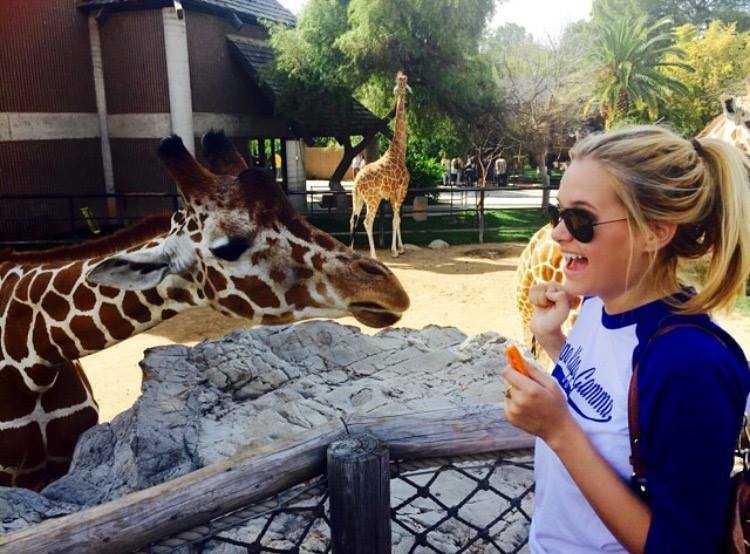 Each fall and spring, Kappa hosts two philanthropy events, Kappa Con Queso and Hoops for Hope. Both of these events are designed to support our national philanthropy, Reading is Fundamental, as well as another charity in honor of a Kappa sister. 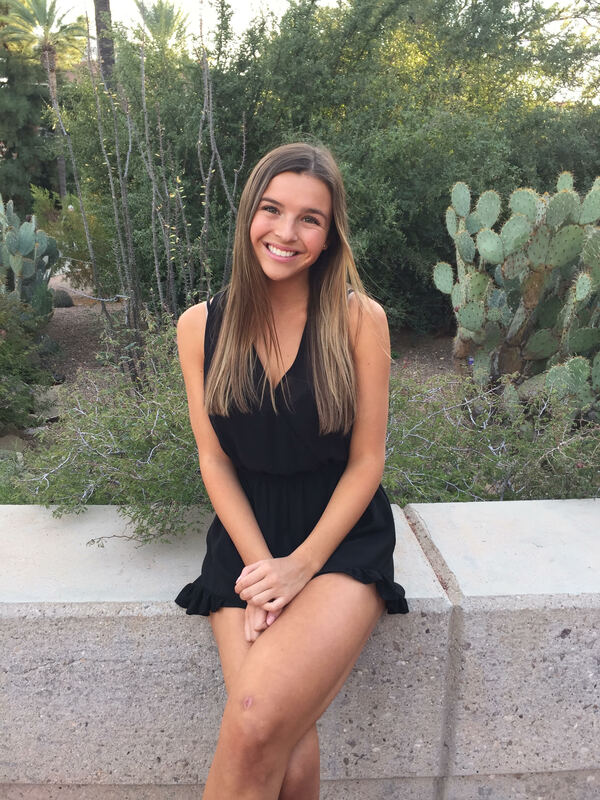 It is my job to encourage and excite our members to engage in service opportunities that impact the Tucson community and the University of Arizona. Hobbies: Experimenting new restaurants, working out, traveling, spending time with family and friends. Favorite Kappa Memory: Although Kappa has given me so many amazing memories and opportunities, I would have to say living in would be my favorite! Being able to share a room with my three best friends, and a whole house with 90 inspirational women has given me endless memories. Whether it's dance parties, or eating brunch on the front porch in the morning, I have found my life-long best friends and a home within Kappa. Position Description: As the Event Chairman, it is my job to plan and organize all events for the Gamma Zeta Chapter. Date dashes, formals, mom/dad weekends, family weekend, Spring Fling, and Homecoming are my top priorities. Our chapter is very social and it is my job to keep it this way! 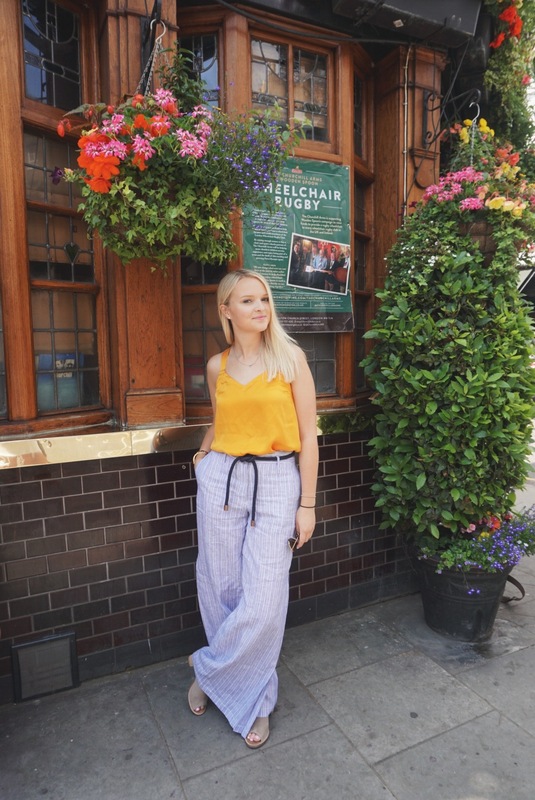 I work very closely with the Public Relations and Risk Management Chairmen and enjoy getting the girls excited for upcoming events. Favorite Kappa Memory: From meeting everyone on Bid Day to living in this year with all my closest friends and sisters, Kappa has given me too many amazing memories to count. Aside from the countless memories from our first year, some of my favorite times with my sisters have been spent living together in the Kappa house. Never again will I be able to say that I got to live under the same roof as 90 of my closest friends. There's truly nothing I love more than spending every possible second with these girls and everything we do together is something to remember. I cherish every second of it and I look forward to all the memories to come. Position Description: As New Member Educator my mission is to ensure that our new members are equipped with the knowledge and guidance to be the best Kappas that they can be, while also preparing them for success in everyday college life. In doing so I will become their leader and go-to resource for anything that they may need during their New Member period. I will also plan exciting events such as Bid Day, Big Little Reveal and Pledge Presents to help welcome them into our Chapter. Favorite Kappa Memory: Living in the house with 93 of my kappa sisters and been one of the most memorable experiences yet. The friendships I have made through Kappa are going to last a life time and I am so excited to help Pledge Class 2018 make the same memories that I did. Position Description: As the House Chairman I am responsible for managing the day to day operations around the Gamma Zeta house. I am also the liaison between the chapter and our house director. In addition I keep a open line of communication with our national house board. 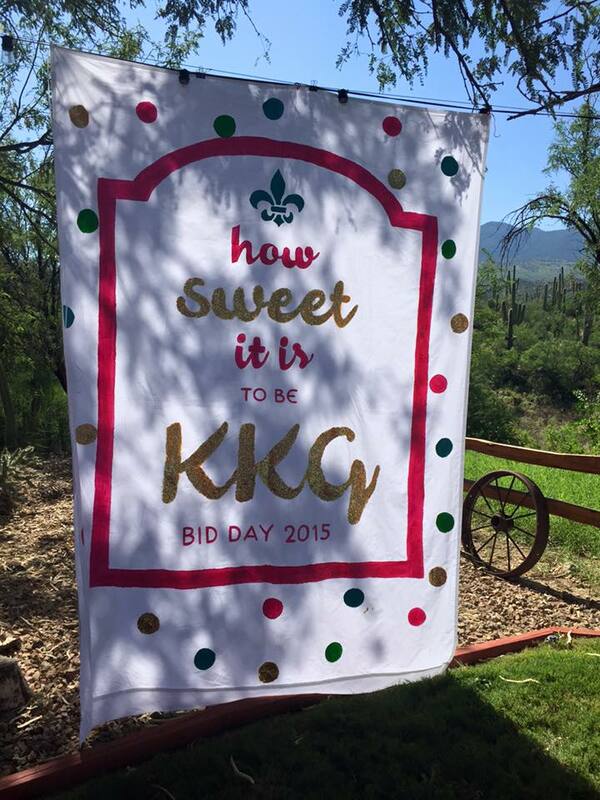 Favorite Kappa Memory: My favorite kappa memory so far was bid day. After I opened my bid I ran excitedly with 100 plus girls to join our new sorority. Later that day I met a girl who seemed to be the complete opposite of me. Throughout syllabus week week we did nearly everything together, needless to say she is now my best friend and I cannot imagine life without her. Kappa has brought me numerous life long friends! Position Description: My role as Corresponding Secretary is to answer and send all chapter correspondence. I also ensure that all material that requires ordering such as new member pins, new member badges and kappa notebooks is done in a timely and efficient manner as well as organize and keep records of all mail and packages sent to the house. Hobbies: Snowboarding, Wake-boarding, Playing the Ukulele, and spending time with my friends. Favorite Kappa Memory: My favorite Kappa memory this year would have to be getting pinned by my big during initiation, this was an overjoying and prideful experience and it ensured me that kappa is where I belong. Position Description: My position as registrar requires keeping information for members of the chapter in key reports up to date, and inputting the new information from the members of the incoming pledge class. I am also responsible for organizing and scheduling the Composite Photoshoot and ordering the final composite. As the year comes to a close, I gather together pictures that I receive from the chapter and am responsible for setting up a date and time for everyone to come together to create a scrapbook of the memories that were made throughout the year. Favorite Kappa Memory: Even though I’ve only been apart of Kappa for a few months, I’ve made so many memories and met so many great people. My favorite memory so far was Bid Day because it was such an exciting end to a long week of recruitment. 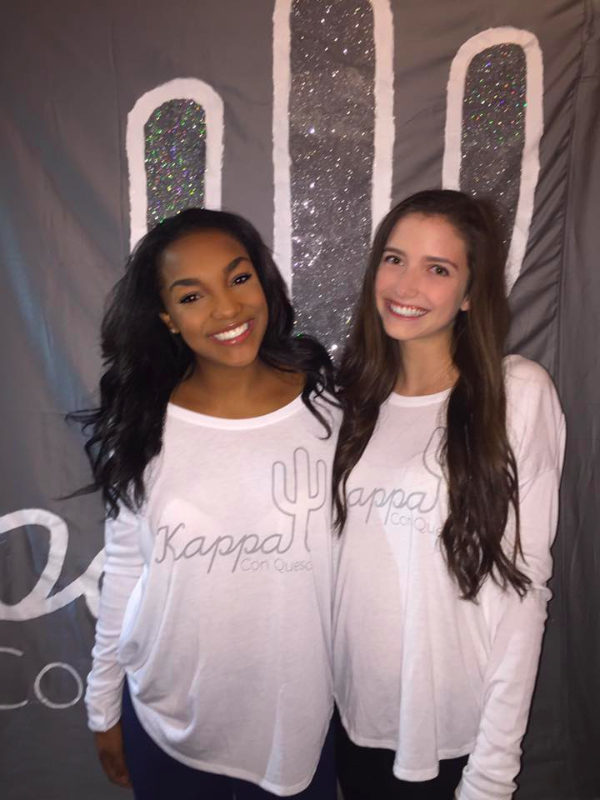 Finding out that my roommate and I both got a bid to Kappa was a feeling I won’t forget and getting to meet all my new sisters was such a fun experience. Position Description: My job as Recording Secretary is to track the attendance of all members at all mandatory Kappa events and to excuse girls from events as well. I take minutes at Chapter on Monday nights and during Chapter Council meetings. I also update the bylaws and communicate with the Fraternity by sending a copy of certain documents, such as minutes, each week. Favorite Kappa Memory: Although I have only been with Kappa for four months it is so difficult to choose a favorite memory. However, the one that pops up in my mind first is bid day when I met one of my best friends. We found out that we were both from the same town in Missouri and happened to live only three minutes away from each other. Little did I know she would eventually become my roommate and best friend. I am so thankful for bonds like this that I get to share with countless women in Kappa Kappa Gamma.